Philip Seymour Hoffman posed for this chilling portrait session at the Sundance Film Festival in Park City, Utah, exactly two weeks before his death on Feb 2nd. He died at the age of 46 from an apparent drug overdose. Such talent, such shame. He sure does not look well or happy. His eyes say it all. 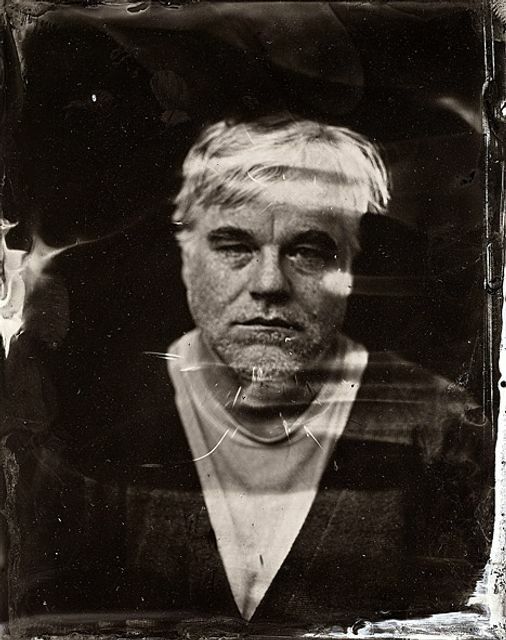 The devastating tintype, wet collodion-style image, which was taken by Associated Press photographer Victoria Will on Jan. 19, shows a more somber side of Hoffman -- looking haunted and slightly agitated. "I remember looking at him and thinking he didn't look well,"
Can paps please stop rooting through the late Philip Seymour Hoffman's bins- we don't need daily heroin bag stats or pics of him passed out.